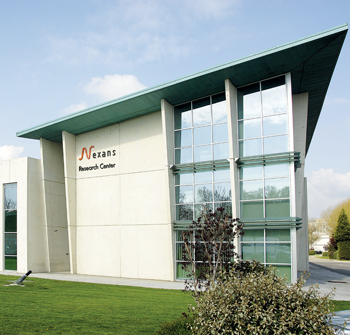 Qatar International Cables Company (QICC), Nexans’ subsidiary in Qatar, will supply MV and LV cables. The first batch of cables was urgently delivered with a 15 day lead time. Operation of the plant is due to begin in June 2018. The Umm Al Houl plant, 20 km south of Doha, will be the largest integrated power and water plant ever constructed in Qatar, in a project worth 2.9 billion euros. Once completed, the facility will increase the power generation in Qatar to 11 GW, and water desalination to 535 MIGD to service the growing power and water needs. Samsung C&T was awarded the contract by a consortium made up of Qatar Electricity and Water Corp (QEWC), Mitsubishi, Qatar Petroleum and Qatar Foundation. The cables will be manufactured at the QICC plant in Mesaieed, Qatar. Nexans has announced the launch of several new products. These include copper-based solutions to support bandwidths of 25Gb/s and 40Gb/s Ethernet. The company said developing this technology is part of its vision of supporting the world’s growing data needs. Nexans’ LANmark-7A is now upgraded in frequency from 1000 MHz to 1250 MHz to fully cope with the demands of 25 GBase-T. Designed for applications beyond 10 G, LANmark-7A supports existing RJ45-based legacy equipment using the backwards-compatibility of GG45 connectivity. This technology allows for a seamless migration to 25 G over 30 m while being fully compatible with 10 GBaseT over distances greater than 100m. Category 7A is currently the highest performing standard available and is specified to 1000 MHz. Although 25 GBase-T will use 1000 MHz as upper frequency, some headroom is required from the cabling. LANmark-7A has always delivered headroom beyond the minimum and this change formalises that for new installations. Existing installations of LANmark-7A may also be qualified to support 25GBase-T.
LANmark-8, which will also be launched, is based on LANmark-7A with enhancements including the ability to support frequencies up to 2000 MHz, enabling transmission of 40 GBase-T over 30m. Both systems are based on Nexans’ GG45 connector, which is a screened RJ45 compatible cable jack specified up to 2000 MHz. These developments were designed specifically to address the challenges of supporting high frequency Ethernet applications in excess of 10 Gigabits. Combined with LANmark-7A cable and patch cords, GG45 offers support for 25GBase-T. Combined with a LANmark-8 2GHz cable, GG45 offers support for 40GBase-T.